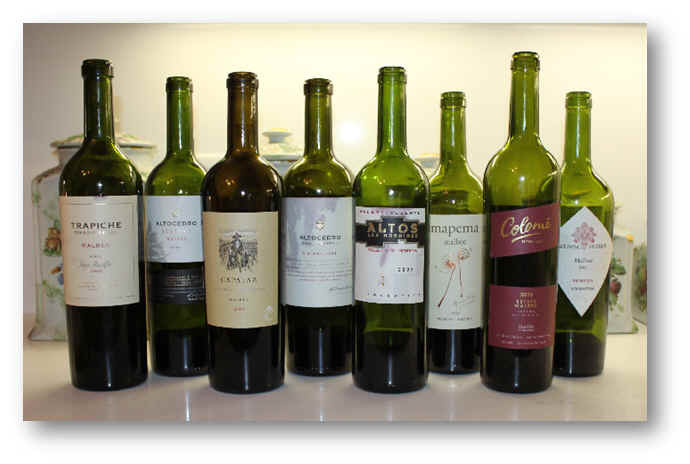 The Vino Fino group evaluated a set of Malbec wines from Argentina for our October 2013 tasting event. 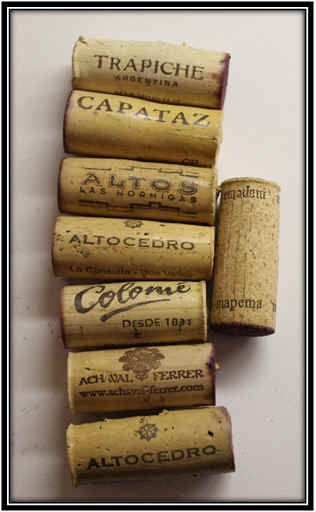 The Malbec grape was quite prominent in Bordeaux until the infamous 1956 frost which killed numerous vines. The grape is sensitive to frost and sometimes growers have issues with coulure (or shatter, where the flowers don't develop and turn into fruit). Transported to Argentina, it seems to thrive there, producing, these days, wines of dark color, full body and with lots of ripe fruit notes. 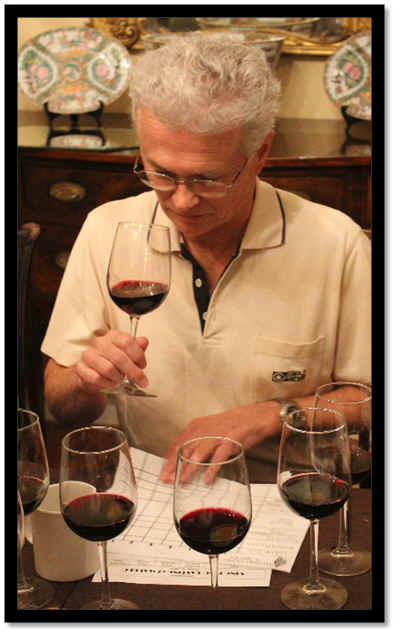 We see Malbec wines in all price categories, so we assembled a set of wines from prominent producers. They ranged in price from $19 at the low end and $53 on the high. One wine, from an historic, well-established winery, easily out-paced the group. 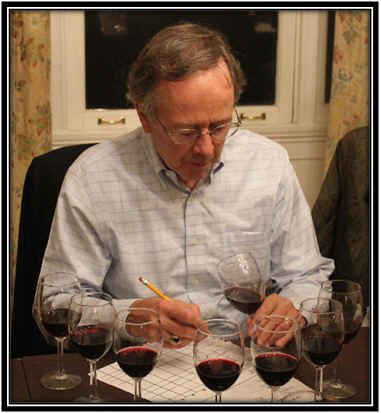 Six of the eight wines had a first place note and 5 of them had a last place ranking. The general consensus was this set of wines showed nicely. 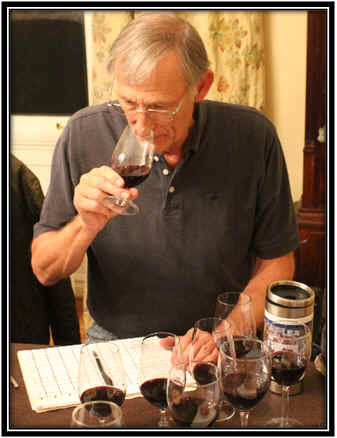 Most of the tasters said they found virtually all the wines to be of some interest. I was less thrilled by these, however, finding them lacking structure (for the most part). What they lacked in overall complexity or depth, they made up for in color and body. 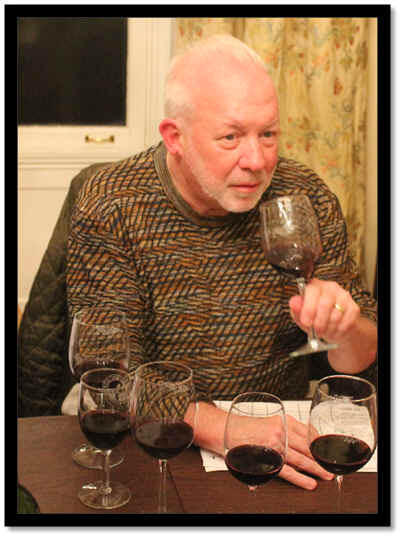 This producer is often highly-touted by various segments of the wine industry and yet I've never had a Malbec of interest in a tasting, blind or otherwise. This wine was quite dark in color, almost inky. It seemed clear in appearance. The fragrances were of ripe, black fruits with a touch of oak and cedar. It's dry and moderately acidic...medium bodied...earthy flavors and not particular fruit character on the palate made this my least favorite wine. It's not flawed, apart from being simple and having flavors which are far less interesting than its aromas. No stars on my three star scale, signifying a wine of standard quality. Clear in appearance and deep ruby in color, this wine was simply ripe to a bit over-ripe. I found a lightly jammy quality to the nose and this matched its seemingly low acidity. Yet the wine is medium-full in body, but given the ripe elements, it seemed to be a bit herbal and had a faintly un-ripe character. Soft, medium intensity...standard to dull...No stars from me. Medium deep ruby in color and clear in appearance, I appreciated the dark fruit notes on the nose and the hint of candle wax fragrances. There was a faintly woodsy, cedar tone there, too, reminding me a bit of nice Bordeaux wines. It's dry and has a moderate level of acidity. Medium+ to full-body. There's a touch of tannin here, which I appreciated more than other tasters, apparently. Again, its Bordeaux styling was appealing to me. I gave it a one-and-a-half star rating. Clear in appearance and deep ruby in color, this wine seemed to show a ripe aspect to the fruit on the nose, being a bit jammy and perhaps a touch hot. It's dry and moderately acidic...full bodied...dark fruit on the palate, it's big, full and ripe. I gave it a one star rating...nice, but not hugely special. This wine was dull in appearance and quite dark to inky in color. With its Gran Reserva designation, one might expect this to be superior to the same producer's Reserve bottling, but it's not. It is merely made of riper grapes which give the wine a mildly plummy note verging on prune-like. There's a bit of oak showing here on the nose and finally the wine seemed a bit like a brandy or other distilled spirit. It's dry and low in acidity with medium-full body. On the palate the wine suffers from being both hot and flat. No thanks. No stars. Clear in appearance and medium-deep ruby in color, this wine showed a fairly oaky, woodsy fragrance at the outset with ripe and intense blackberry and violet notes on the nose...very captivating on the nose. It's dry and moderate in terms of acidity. 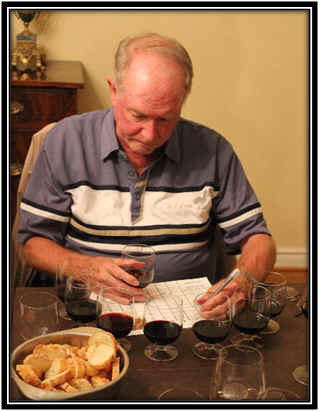 Full bodied, the wine shows a somewhat tannic, moderately aggressive character with ripe fruit and a bit of heat. It's a bit disjointed and seemingly made for those wanting power above all else. One star. Clear in appearance and medium+ ruby in color, I found mildly woodsy notes to start here with a bit of candied fruit. Very promising on the nose, the wine is dry and moderately acidic. Full-bodied it's big, huge, intense, lightly tannic and note especially profound despite its size. I found it superior to their Grand Reserva, being a bit better balanced. One star. Clear in appearance and medium+ ruby in color...this wine hits the right notes on the nose: dark fruit and a beautifully cedary, woodsy bouquet. Very fine. It's dry and moderately acidic. Medium+ to full bodied without being a fruit bomb. It's lightly tannic on the palate with dark fruit and nice oak...elegant and refined. I gave it a one-and-a-half star rating.